"This is the house where we found the first victim. The tree fell on the young man. He was in the bunk bed on the bottom bunk," said McKinley. Allen McKinley is with the Hattiesburg Public Works Department. After the storm he and his team cleared the streets for rescue workers. McKinley's in the area locals call the "Flats" around Alcorn Street. Cars are in trees, insulation is hanging where roofs were sheared off homes and mangled debris fills the yards. It's quiet. Residents are still in shock. Kayla Randle is amazed she and her husband survived. She says she heard what sounded like a train. Randle says her husband wrapped his arms around her and they began turning. "The roof came off we were spinning around in the tornado. 'You were literally spinning?' Yes ma'am. Like you could see it was purple and gray. You could see all the debris just flying around," said Randle. The pair managed to crawl out from under the collapsed roof. Nearby, Ophelia Jones is salvaging what she can. Friends and volunteers are putting her belongings in a moving truck. Jones says she crouched in a corner when the storm hit, the roof came off and a beam fell on her bed. She tried to leave and drove into a nearby ditch. "The next morning my friends came by and knocked and they said 'here she is, here she is' and pulled me out the car," said Jones. Delmetric Thompson and her family laid on the kitchen floor and survived. But the house is destroyed. She says while they were gone looters took what they wanted. "I was able to get my TV's out and we took some furniture out and I got that on the truck right there," said Thompson. 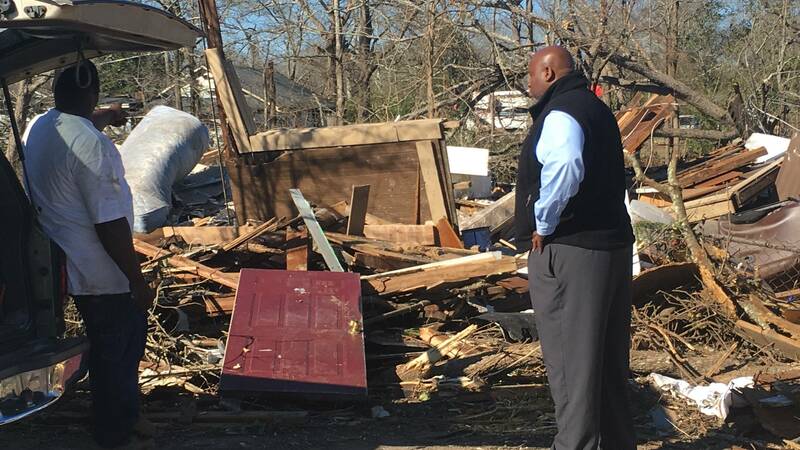 Mississippi Emergency Management says the storm killed 4 people and injured more than 50. In Forrest County more than 1,100 homes were affected by the tornado.